Life as a shop girl has changed a lot since we open our first shop back in 2011. (Remember Bloom??) There are days when I miss the brick and mortar aspect of our shop. I love the physical aspects of retail — visual merchandising is one of my strongest suits. The act of hanging new clothes on the rack, watching customers browse through, seeing someone’s joy finding something they really love. I do miss the romantics of brick and mortar retail. But as much as I miss the highlight reel of brick and mortar memories, the warehouse where we now house our online shop, inventory, and studio is our best fit. We can work at our own pace without the interruption of patrons, we can work the weird hours that we need as we juggle life with a toddler, we can stretch out and be ourselves in this big empty white room. I miss the beauty of the store, but there is so much creative space and energy in our warehouse, it’s really exciting walking in each day. To most people, this is just a painted white, industrial warehouse space. But to us, it’s a blank canvas, ready for us to proverbially paint. I find myself reaching for easy pieces like this speckled sweater and these new Everlane work pants to pair with my sneakers most days. (This outfit looks a lot like last weeks! I have a recurring outfit theme lately, can you tell?) Today is dreary so bun was necessary and I didn’t have time to really do much else but shower this morning. But I find that if I have a few basics on, I feel pulled together for a Monday. Side note: I love these pants from Everlane. They are stretchy poplin almost, not quite Ponte fabric. They hold their shape really well. I’m in the 8s and they hug me pretty tight, but I say fit very true to size. My only complaint is probably someone else’s favorite feature: a side zipper. I never love a side zipper but it’s not a breaking point for these at all. You can find them here. 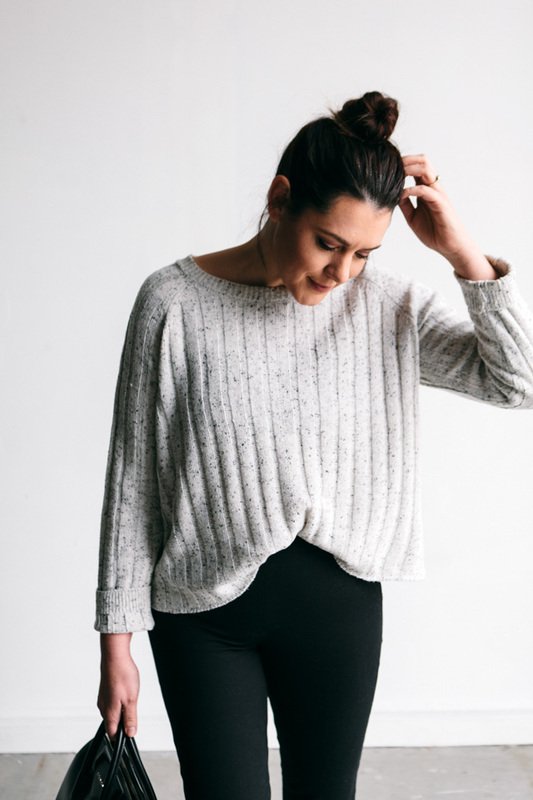 My sweater is under $50 and from the shop here! I am in the medium in these photos here. It’s loose fitting but true to size. The pants are fitted but true to size! I am in the 8. The sweater is TTS, but loose fitting I am in the medium. The shoes are TTS for me, a size 10. My Favorite Under $25 Tee! Such a cool comfy look! This looks so cozy! 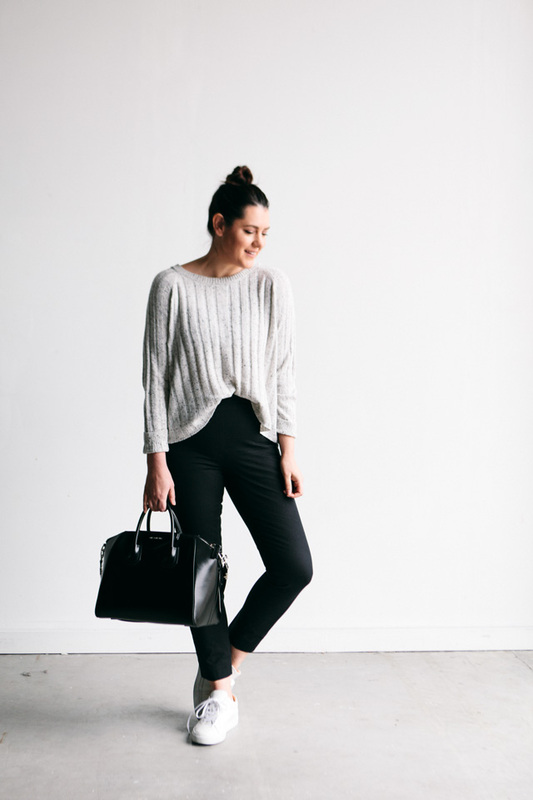 I’ve heard a lot of great things about Everlane pants. I might have to give them a try.